I have chosen the EOS-7D as the best APS-C camera 4 years in a row for wildlife photography and the Series II successor is beginning to head that way. Canon has released a new firmware, Version 1.0.5 on September 9, 2015 to address some technical issues. Below are some quick tips and tricks and tutorial videos from Canon on how to get the most out of this new camera. Take a look because it will be worth your while. The EOS 7D Mark II built-in flash allows you to shoot stroboscopic multi flash without external Speedlites. If you plan on doing this, you will find the maximum power of your flash is not as high as in normal shooting. In fact, the maximum flash power you can set is quarter power. This is because the flash needs to fire several times and does not have time to recycle fully between each burst. If you need more flash power, then you should use additional Speedlites in a multiple flash setup. To quickly access the flash menu settings when using an external Speedlite, you can press the Flash button that is normally used to raise the built-in flash. This gives you access to most of the flash controls. However, there are three that are missing: Flash Firing, ETTL metering and Flash Sync Speed in Av mode. If you need to access these settings, you should instead reach the flash menu from the main menu settings and select Flash Control. When using an external flashgun, you may find the flash fires at full power, possibly over-exposing the subject regardless of the flash power required. This can happen for two reasons: firstly, check the Speedlite’s Custom Function setting for “Flash metering mode” – if this is set to TTL, the flash will always fire at full power. Simply change it to ETTL to get accurate flash exposures again. The second reason is the flash model – if the Speedlite is not an EX series, but perhaps an older EZ series model, the flash will always fire at full power – switch to an EX series Speedlite to gain accurate flash metering. The EOS 7D Mark II features a multiple exposure option to allow you to composite up to nine images into one, directly in-camera. If you have the camera set to ‘M(RAW)’ or ‘S(RAW)’, then be aware that the composited image capture on the memory card will actually be a full RAW image rather than one which matches your image recording settings. You will need to resize the image on your computer after shooting if you want a smaller file. When shooting with Live View and using Speedlite flash, you may hear the shutter sound twice. This is not the camera taking two images, but simply the shutter closing to be able to carry-out flash metering. Because of this, the time between pressing the shutter button and the image being taken will be slightly longer than when shooting without flash. If you need the shortest lag possible between pressing the button and the image being taken, you should turn Live View off and shoot using the viewfinder. When using the built-in intervalometer of the EOS 7D Mark II to capture timelapses, it can be a challenge to sort out images afterwards as you will undoubtedly capture a large number of images. To help keep the images organised on your card, before starting each timelapse sequence, create a new folder. That way, all the images from that timelaspe sequence will be together in one folder, separate to any other sequences or images, and it will make processing them on the computer much easier. When shooting HD movies with the EOS 7D Mark II, it is possible to record your footage to an external recorder via the HDMI output port. This output port will send both video and audio to the external recorder. Because of this, if you need audio you should always make sure Sound Recording is set to On otherwise the footage recorded on the external recorder will have no audio with it, making syncing with sound recorded elsewhere very challenging. When using the HDMI output to record movies to an external device, you should check your Auto Power Off settings for the camera. By default, the camera will Auto Power Off after the time elapses. Even if you set the Auto Power Off to disable but you are using the Mirroring setting, the HDMI output will stop if you don’t touch the camera for 30mins. To prevent this, simply make sure you touch a button on the camera to keep it alive – a half press of the shutter button, for example. When shooting movies on the EOS 7D Mark II, you can adjust the function of the shutter button both when pressed halfway or fully during movie recording. If you set the shutter button to start or stop movie recording, then you will be unable to take a still photo during movie shooting. If you have made any changes to the function of the shutter button through the Custom Controls, then the ‘Movie Shooting’ setting will override them while you are shooting movies. When recording HD movies over the HDMI output to an external recording device, if you are outputting the data with no information overlay (in other words a clean HDMI signal out), then you should be careful when selecting Mirroring or No Mirroring. If you have No Mirroring set, then any camera warnings (for example remaining card capacity, battery capacity or internal temperature warning) will not be shown on the external device or on the camera’s rear LCD display. If you wish to see the warnings, then make sure you select Mirroring so the warnings are shown on the camera’s LCD display. Like several other cameras in the EOS range, the EOS 7D Mark II can output a clean HDMI signal allowing external recording of movies. If you are shooting movies and recording to an external device, you should avoid capturing a still image during video recording. If you do, you may find the timecode or audio is no longer synchronised with the video. Instead, you should stop video recording, capture the still and then go back to recording video. When shooting movies with the EOS 7D Mark II, you can select from three different AF area modes: Face Tracking, Flexizone-Multi and Flexizone-Single. If you move between then for different situations, while making use of the Movie Servo AF tracking sensitivity setting within the menu, you should remember that unless you use Flexizone-Single, whatever setting you make in the tracking sensitivity, will function as if it is set to 0, ie: a balanced setting between locked on (-2) and responsive (+2). Within the EOS 7D Mark II menu system you can adjust the AF tracking sensitivity for movie shooting AF. This allows you to tailor the AF function so that it is either more stable in tracking a subject – for example less likely to jump to a new subject if an obstacle passes between you and the main subject – or more responsive so it will focus faster on any subject passing through the AF point. There are a range of five settings, from -2 to +2. To make use of this function properly, you should ensure the AF function is set to FlexiZone-Single. The EOS 7D Mark II features the ability to adjust the AF Servo speed for tracking focus in Movie shooting. If you have made changes to this setting but find there is no difference in the Servo speed, check the lens you are using; this function is only enabled when using USM lenses marketed in 2009 or later, or when using the STM range of lenses. If you are not using a lens in one of these categories, the AF speed will be the same as the Standard setting. The EOS 7D Mark II features a menu setting to adjust the Movie Servo AF speed in one of five levels from Standard speed to Slow speed. This will adjust the transition speed between points of focus so you can tailor the AF response for a natural result. When using this setting you may find that the AF speed seems no different to normal even though you have adjusted the speed. If this is the case, check the AF Method you are using as the AF speed adjustment will only take effect when using the ‘FlexiZone – Single’ setting. In Face Tracking or ‘FlexiZone – Multi’, the AF speed will be the same as the Standard speed setting. When using the Movie Servo AF setting on the EOS 7D Mark II to track a moving subject, you may notice a change in the magnification of the movie when you play it back. This can be caused by one of two reasons: either the camera was panned or tilted quickly, or a subject moved towards the camera or away from the camera quickly. If this happens, the video may momentarily expand or contract as the focus changes to compensate. To avoid this, switch off Movie Servo AF when you intend to pan or tilt the camera quickly. The EOS 7D Mark II features a timecode setting like several other cameras within the EOS range. One of these options is Free Run, where the timecode will continue to count up whether you are shooting a movie or not. Because the Free Run timecode setting is controlled by the camera’s time setting, if you change the time, time zone or daylight saving time setting, the Free Run timecode will change too. If you are working with several cameras, either change all of them or none of them, otherwise you’ll find your timecodes do not match up. Like other cameras in the EOS range, the EOS 7D Mark II features a timecode function that makes it easier to match up clips when shooting with several cameras. If you make use of the timecode setting and then take a still picture during movie recording, you will find that the timecode and the actual time no longer match up, making it hard to sync up clips. If you are planning to use the timecode function, then try to avoid shooting stills during movie recording. When shooting HD movies with an EOS 7D Mark II, you may use the headphone jack on the camera to allow you to live monitor the audio being captured. When using headphones there might be times when you need to adjust the volume coming into them to make it easier to hear the audio. If so, press the Q button and hold down the rate button while toggling the multi-controller up or down to increase or decrease the volume. Note that this only adjusts the headphone level, not the audio recording level. When shooting HD movies with the EOS 7D Mark II, you can make use of the A+ mode to control the camera settings for you. In this mode, audio recording can be set to On or Off. If set to On, then the audio recording level will also be set automatically depending on the audio level in the scene. This may work well on occasion, but if you are filming in a windy environment, you will need to switch out of A+ mode so you can manually adjust the audio level and, crucially, make use of the Wind Cut filter. When shooting movies on the EOS 7D Mark II, you can use the Noise Reduction setting for the internal microphone to help reduce wind noise and distortion. If you are also using the headphone port to allow you to monitor the audio you are recording, you may find the audio sounds like there is wind noise or distortion. This is normal as the camera does not apply the noise reduction to the headphone port audio so what you hear will be a little different from what is recorded on the camera. The EOS 7D Mark II allows you to set a recording frame rate of 24.00fps so you can match footage from other cameras shot at this frame rate. When using this setting, you will find that the HDMI frame rate option cannot be set. This is because the camera locks it to 24.00p to match the footage being recorded. If you need to output over HDMI at a different frame rate, you will need to select a different recording frame rate too. The EOS 7D Mark II features a menu option to record movies at 24.00fps. While this may seem very similar to the 23.976fps (aka 24p) also available, they are for separate uses. In general use, you should select the 23.976fps option. The 24.00p setting is only for movies where you must shoot at precisely 24.00p to match your footage to other footage shot at 24.00p on film cameras. If this is not what you are doing, then stick to the 23.976fps option. While some EOS DSLRs can focus with lenses or lens and extender combinations that give a maximum aperture of f/8, others cannot. If you really need to try and use autofocus at f/8 then provided your subject is not moving, you may find switching to Live View and focusing with the Live Mode AF may work. While it still requires a reasonable amount of light to be able to detect sufficient contrast to focus, it can help you when otherwise you’d be forced to focus manually. Usually when shooting Movies on an EOS camera, it is possible to capture a still image at the same time simply by pressing the shutter button. This causes the movie to pause for about a second and then continue. If you find you can’t capture a still image while shooting movies on the EOS 7D Mark II, it is most likely due to your frame rate settings. If you are shooting at 59.94fps or 50fps, the camera is unable to capture a still and so the shutter will not be released. If you need to capture a still, change the frame rate to one of the other settings. The EOS 7D Mark II offers a range of frame rate options when shooting Full HD movies, including 59.94fps and 50fps for slow-motion effects. When setting either 59.94 or 50fps in Full HD Movie shooting, you will find that the Movie Servo AF using the Dual Pixel CMOS AF system no longer functions and the camera makes use of contrast detection AF instead. This may result in either jumpy or slow AF in Movie mode. To avoid unnatural AF switch instead to using manual focus at those frame rates. When shooting HD movies on the EOS 7D Mark II, there are two options for recording format – either MOV or MP4. Previous EOS cameras produce MOV based movie files and these are the best option if you want to edit your footage afterwards and produce the highest video quality. If you want to share your videos with a wider range of devices, the MP4 format is a better choice, as it is a more widely accepted format on devices like mobile phones, tablets and smart televisions. The EOS iTR AF system in the EOS 7D Mark II allows the camera to track moving subjects more accurately by using data from the metering sensor to track both faces and colours. With the EOS iTR AF setting enabled, you may find the camera is not picking up faces or colours to track. This is most likely due to your AF point selection method. To ensure the EOS iTR AF functions, the camera needs to be set to Zone AF, Large Zone AF or 65-point auto selection. In any of the other focus point selection modes, the EOS iTR AF will not function regardless of the menu setting. Like the flagship EOS-1D X, the EOS 7D Mark II features EOS iTR AF, which improves autofocus tracking by recognising faces and subject colours in addition to looking for subject contrast. When shooting with the EOS iTR AF function enabled, you may find the AF is actually slightly slower and the maximum shooting speed in continuous high speed AF is slower than expected. This is especially likely in low-light shooting and is due to the extra data being processed from the metering system before a subject can be tracked. If you need the fastest AF possible and want to achieve the maximum frame rate and do not need to make use of the colour and face tracking, switch the EOS iTR AF setting to ‘disable’. Using the AF point orientation function allows you to switch quickly and easily from portrait to landscape shooting and vice versa and have the camera automatically change the focus point and even focus point selection method for you. If you’ve set up different settings for landscape and portrait shooting but find that the camera is not switching the AF points or modes for you as you turn the camera, it may be because you have attached a lens from ‘Group G’ – these are lens and extender combinations where the maximum aperture drops to f/8 or lower. Using one of these may clear the orientation linked AF point setting. If you use one of these lenses, remember to re-check your linked orientation point settings prior to shooting again. The EOS 7D Mark II features a large number of AF modes to allow you to choose exactly the right AF points for the subject you are photographing. Within the camera menu you can select exactly which AF modes are selectable based on your personal preferences. If you are shooting and find you are unable to select Zone, Surround Expansion or Auto Select AF points, check your lens. Lenses that belong to Group G can only be used with single point Spot AF, Manual AF point selection and the first of the AF area expansion settings. The Group G lenses are those that when an EF2x Extender is used, it causes the maximum aperture to drop to f/8 or smaller. If in doubt, you check the manual for the camera where a complete list can be found. If you move to an EOS 7D Mark II from either an EOS 7D or EOS-1D Mark III/IV or EOS-1Ds Mark III, you will find the AF feature for AI Servo tracking sensitivity is no longer there. In the EOS 7D Mark II, the setting has been renamed as simply “Tracking Sensitivity”. Beyond the name change though, the setting has exactly the same function as in the previous models. The viewfinder of the EOS 7D Mark II is able to display a variety of shooting information such as shooting mode, white balance, drive mode and image quality among others. By default, only the flicker detection setting will be displayed. Should you wish to see the extra information, to help you keep on top of the camera settings without taking your eye from the viewfinder, the settings can be enabled from the “Viewfinder display” option in the second yellow menu tab. Even if you leave the displays turned off, when pressing the WB/Metering mode or Drive/AF buttons, or when you change the position of the AF switch on the lens, this information will still be shown in the viewfinder so you can see what is being altered. When shooting with the EOS 7D Mark II in continuous shooting, you may find the frame rate does not sound as fast as you expect it to be. Assuming that the shutter speed is fast enough to enable you to shoot at 10fps, you should check the anti-flicker shooting setting. When anti-flicker shooting is enabled, you may find the frame rate drops slightly as it tries to avoid flicker. If you are not shooting under lighting that flickers, such as a fluorescent tube, simply disable the anti-flicker mode and you will maximize the speed of continuous shooting. Nice post Michael! The 7DmkII is an awesome camera! Keep them coming! Yes, Rick. This is a very good camera. 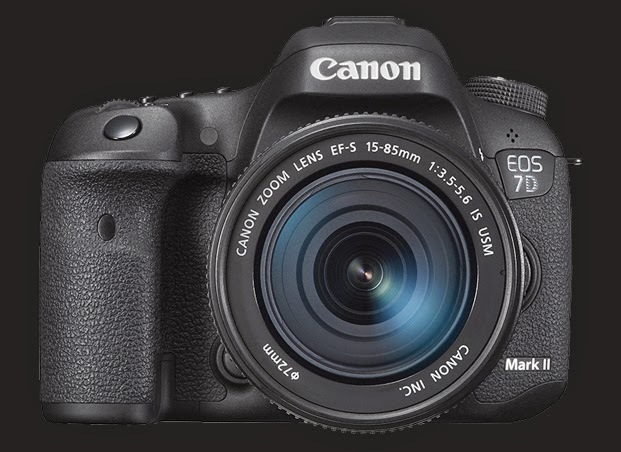 The recent firmware released by Canon for the EOS-7D Mk II is an improvement. The AF @ f/8 is working better. Check out these tips and tricks. They come in handy.